Lee Gregory – The Next Non-League Star To Turn Pro? FC Halifax Town hotshot Lee Gregory is the latest non-league player rumoured to be garnering huge interest from Football League clubs. 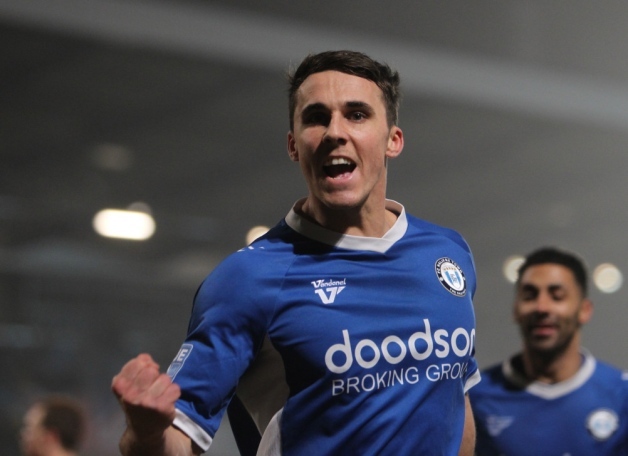 The twenty five year old has struck 26 goals in his first season in the Conference Premier, and it looks like he will ply his trade in the professional game next season, even if The Shaymen miss out on promotion. Gregory’s goals have helped propel Halifax back into non-league’s top flight, and the step up in division has done nothing to curb his goalscoring prowess. His brace against Alfreton Town in a televised BT Sport game took him level with another coveted Conference Striker; Luton Town’s Andre Gray at the top of the scoring charts. In fact, he has scored more goals this campaign than he did in either of his previous two seasons in Conference North (22 and 20). The best thing about Gregory is that he seems to be a complete striker. Strong and skilful, he can score any type of goal. His double against Alfreton epitomised that; his first a wonderful curling finish with very little backlift, and his second a tap-in inside the six yard box. It really comes as no surprise that so many professional clubs are looking into securing his signature for 2014-15. I myself have seen Gregory play once in the flesh, and he was on fire that day, scoring four in a thumping 5-0 win against Gloucester City last season, including a first half hattrick. Blackburn Rovers have been heavily linked with a move, while Notts County are also among his admirers. Crawley Town were reportedly close to signing Gregory on the final day of the winter transfer window, but had three offers turned down by FC Halifax. Gregory – an electrician by day – even took January 31st off work in case an offer was accepted and he needed to go to a medical. One thing is certain this summer. FC Halifax are going to have to brace themselves for a barrage of interest, and no shortage of offers for their prize asset. Can they hold on to him? If they manage to gain promotion through the playoffs, they’d have a chance in my opinion. If they don’t, they will probably have to cash in on a prolific striker who will only have a year left on his contract. Posted on March 25, 2014, in UTL Archive and tagged FC Halifax Town, Lee Gregory. Bookmark the permalink. Leave a comment.